Looking back on my experience running the 2013 ING New York City Marathon, it’s hard to capture all of my thoughts and feelings through 26.2 miles of running. From the elation of reaching the peak of the Verrazano Bridge, seeing the majesty of downtown Manhattan splayed out on my left and 25 miles waiting ahead, to the pure frustration of having my legs seize up on me (again) in Central Park with only one mile left…it was a roller coaster both physically and mentally that I will never forget. The race was as advertised and although it would be apropos to call it was a once in a lifetime experience, I can’t rule out the possibility of a repeat adventure sometime down the road. 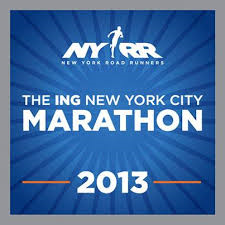 The first step in running a marathon like NYC is to find a way to get in. With the cancellation of last year’s race due to Super Storm Sandy, many of the would-be non-guaranteed slots were already filled and the normally slim chance of securing an entry through the lottery was even slimmer. I was lucky enough to get connected with a fantastic charity organization called The Hole in the Wall Gang Camp that provides a unique camp-themed healing experience for seriously ill children and their parents. They are one of the few charities who have spots reserved in the marathon in order to raise funds and promote awareness. It was a perfect opportunity to support a great organization and find my way into the largest marathon in the world. After “getting in” the next logical step in marathon preparation is the training plan. There are a variety of sources for training out there on the internet catering in difficulty level from the beginner to the experienced runner gunning for a PR (Personal Record). I chose to follow a Hal Higdon plan since I’d successfully used his system for my first half marathon. In a nutshell it’s an 18 week plan with a rest day on Mondays, shorter 3-8 mile runs Tuesday through Thursday, rest Fridays, long run Saturday, and cross train on Sundays. Now everyone eventually has to shift these runs around and will miss a mid week run or two due to life in general, but the key is to get that long run in every week culminating in the epic 20 miler that is both a dress rehearsal for the marathon and a big time confidence builder. I’m no expert but I believe the goal of Mr. Higdon’s system is to train your body to recover quickly through the mid week running and to focus on getting your muscles to store and efficiently use lots of glycogen through the long runs. Glycogen is the sugar that is stored in your muscles and liver. It is what the body uses to fuel distance running and the reason one “carbo-loads” before a big race. Ideally, you want to max out your stores of this fuel so that you can go as long as possible before the body needs supplemental fuel in the form of gels, bars, Gatorade, etc., during the race. Note that regardless of training, everyone runs out of glycogen sometime between 1.5 to 2.5 hours of running and your body can’t switch to burning other fuel sources like fat in a race, so you also have to train yourself to process supplemental fuel sources on the long runs. I personally went the Gu route but there are plenty of other options out there…the key is to make sure you pick one and test it so that you aren’t trying something new on race day. Training is hard. Training is also addictive and incredibly rewarding. With the NYC Marathon ran in the first week in November, an 18 week program should start the first week in July. That means a lot of either toasty warm sweat-soaker evening runs or brutally early mornings followed by a long day of work. I chose the latter being a morning person and a fan of the idea of having already completed a longer workout than most people tackle in a day, all before 8AM. It really pumps you up for the work day and definitely eases a good amount the normal office stresses that come with the job. For anyone who’s ever run more than 4-5 miles, there’s also that “runner’s high” that accompanies the training and tends of last even after you’ve stretched and showered. I really don’t know much about the science involved but I believe it’s an endorphin release in the brain…whatever it is, to me that’s the part of running that makes it so addictive.